Red White and Blue- let's cheer for you! 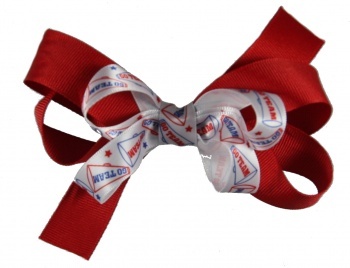 This is a great double layer bow with excellent school spirit colors and the words "GO TEAM" written on the megaphones. The bottom layer is a red grosgrain ribbon that is topped with a white satin bow that has red and blue megaphones and stars on it. Wrapped in the center with the same GO TEAM ribbon.